Hair frazzled by too much bleach? Have a head full of dry split ends? If so, then a good hair mask is the first thing you need to rescue your barnet in double quick time. No stranger to straighteners and the peroxide, I needed something pretty good to stop me from cutting all my hair off and starting again. 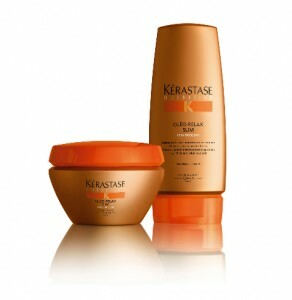 That’s where Kerastase Oleo-Relax Slim hair treatment comes in. Kerastase is a great brand and if you can’t afford their shampoo then at least invest in one of their deep conditioning hair treatments – especially if you have colour treated hair that is weak and broken. You only need to use it once a week, but it’s worth it if you want to keep your hair looking good. Couple that with regular trims, your hair should be looking better in no time! It’s a rinse out treatment and promises to curtail frizzy hair. You should apply two small nut sized portions to towel dried hair and leave for fifteen minutes. I leave it in for longer but it all depends on how dry and course your hair is. TIP: If your hair is really dry, then getting yourself a good leave-in conditioner you can apply after towel drying your hair before styling is a good idea too. This particular hair ‘masque’ is amazing. My hair feels like silk everytime I use it – not the usual mass of tangled rough straw it normally resembles when I step out of the shower. I have fine hair, but I have a lot of it and this is light enough to comb through the length of your hair without it leaving it feeling heavy and greasy. As it’s a rinse out treatment, I usually leave it in as long as I can then rinse it out and style. You can buy this product in almost any salon, but if you don’t fancy paying through the nose for this treatment, I would advise getting this online and one of the cheapest prices I have found is £17.50 for 200ml on the Rush website. Bargain!